I have been on cloud nine since the launch of The Shop Girls in Heffers fabulous bookstore, Cambridge earlier this week. The launch was a sell-0ut, with tickets being snapped up six weeks before the event, even before I had secured some for my family, and my editor from Little Brown and agent had also missed out – until more tickets were released to meet demand. It was very much a celebratory evening, as well as a reunion for many shop girls who had not seen each other for half a century since Heyworth’s closed its doors, the elegant ladies department store which the book is based on. Anne Gaskell: “Congratulations on such a successful book launch! It was such an enjoyable evening – especially with the “shop girls” themselves there and ready to answer questions. When in the queue waiting for you to sign the book, I got talking to Val Haynes, who told me the very sad tale of her sister Judy. What a terrible time it must have been for her family. Val felt that the book was her way of ensuring her sister was remembered. So it has had repercussions far and wide. I am very much looking forward to my Topping bookstore event in Ely Cathedral Centre on Saturday, 25 October, from 11am, part of their Ely Literary Festival. I will be joined by my my shop girl Rosemary who used to live in Ely, and hopefully others too. Tickets can be reserved here, and the £7 admission fee includes a copy of The Shop Girls. 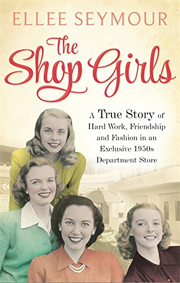 If you would like to know more about the golden age of retail in a bygone era, the true story of my shop girls, then do come along, I look forward to seeing you there!! !